Olivetti launches the third edition of the Olivetti Design Contest, an initiative focusing on promoting industrial design, and aimed at involving students from some of the most prestigious institutes of art and design in Italy and abroad, including the Domus Academy; IAAD (Applied Arts and Design Institute); IED Design Milan; IED Rome; IED Cagliari; NABA; Turin Polytechnic Department of Architecture and Design (DAD); Milan SPD (Design Polytechnic); Milan Scuola Politecnica di Design (Design Polytechnic School); RUFA (Rome University of Fine Arts); École Supérieure des Arts Modernes (Paris); Hochschule Mainz University of Applied Sciences; National College of Art and Design (Dublin); Birmingham City University - Faculty of Arts, Design and Media; Valencia EASD (Escola d'Art i Superior de Disseny); Vilnius Academy of Fine Arts (Vilnius); Zamora EASD (Escuela de Arte y Superior de Diseño); Marmara University Istanbul; Central Saint Martins College - University of Arts London; Holon Institute of Technology; School of Visual Arts New York. The aim of the contest is to select and give awards to projects offering the most original contributions towards the design and development of a smart chair and/or fiscal printer. The jury, chairmanned by Mario Bellini, is composed of Emanuele Cappelli, Designer; Gaetano di Tondo, Olivetti Manager of Institutional and External Relations; Cristina Ghiringhello, Director of Confindustria Canavese; Luca Josi, TIM Brand Strategy & Media Manager; Pierantonio Macola, SMAU President; Alberto Mattiacci, Full Professor of Marketing and Business Management at Rome Sapienza University; Riccardo Meloni, TIM Manager of Human Resources & Organizational Development; Marco Sabetta, General Director of Milan Furniture Expo (Salone del Mobile Milano); Stefano Sertoli, Mayor City of Ivrea. The jury makes its decision taking into account the conceptual elements behind the designs presented, quality of fabrication, commercial feasibility of realising product and, not least, coherency with the system of values for which Olivetti is renowned: customer priority, innovation, experience, excellence and proactivity. The three winning projects for each of the two contest themes will be awarded monetary prizes: €2000 for first placed, €1500 for second placed and €1000 for third placed. In this its third edition also, the Design Contest promoted by Olivetti reconfirms the tradition of great attention to design. For over a century Olivetti places design on the same footing as innovation and experimentation, from the conviction that aesthetics is a fundamental force also behind industry. The central theme of the contest continues to be an egg, in its absolute perfection. Revolving around the subject of the smart chair, the visual consists of an intricate web of coloured lines that, vibrating, celebrate silhouettes that have been used over the years in ergonomic studies for chair design. The lettering, for its part, represents the solid reality of the fiscal printer, interpretable both as letters of the western alphabet and as a barcode. 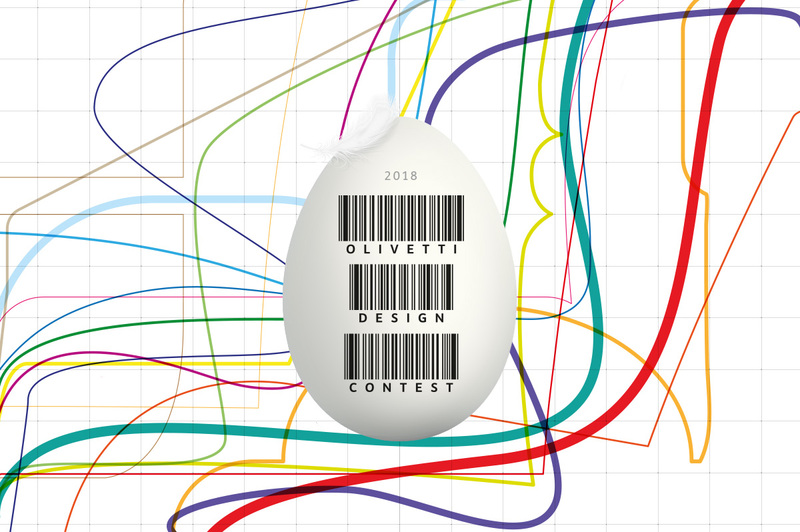 The notice for the Olivetti Design Contest 2018 can be downloaded from the site www.olivetti.com and from the sites of participating institutes.